The Corporate Site will be Renewed! 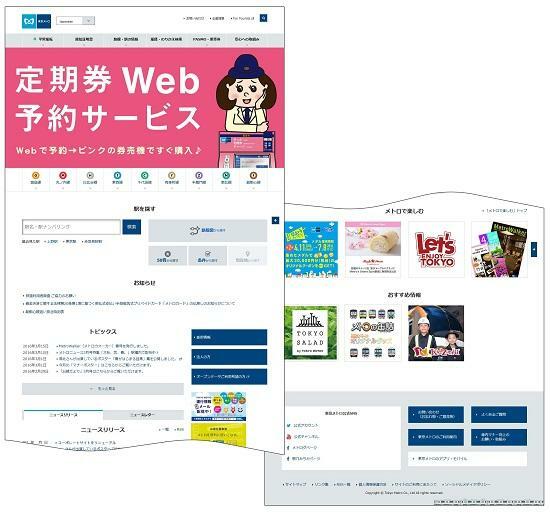 Tokyo Metro (Headquarters: Taito-ku, Tokyo, President: Yoshimitsu Oku) will renew its corporate site (http://www.tokyometro.jp/) on March 29, 2016 for more convenient and comfortable use of Tokyo Metro Lines. This renewal provides a new layout for better access to our information than ever before which a lot of our customers are using, including the traffic information, route/station information, fare/transfer search, and the ticket guidance, etc. In addition, the site will be revised so that customers can have an easy access to the timetable, station map, facility/store, and the barrier-free facility at each station, with additional pages for each route. See an exhibit for details.